It’s a bit of a tradition for me to celebrate my birthday by going on a leisurely cruise along the canals of Amsterdam. I would normally hire a boat, invite some friends and pack some food and wine for a three-hour cruise. This year, I decided to do something different: I planned a whole birthday weekend in Amsterdam, specifically in the A’DAM Tower! I spent my birthday weekend in the A’DAM Tower. 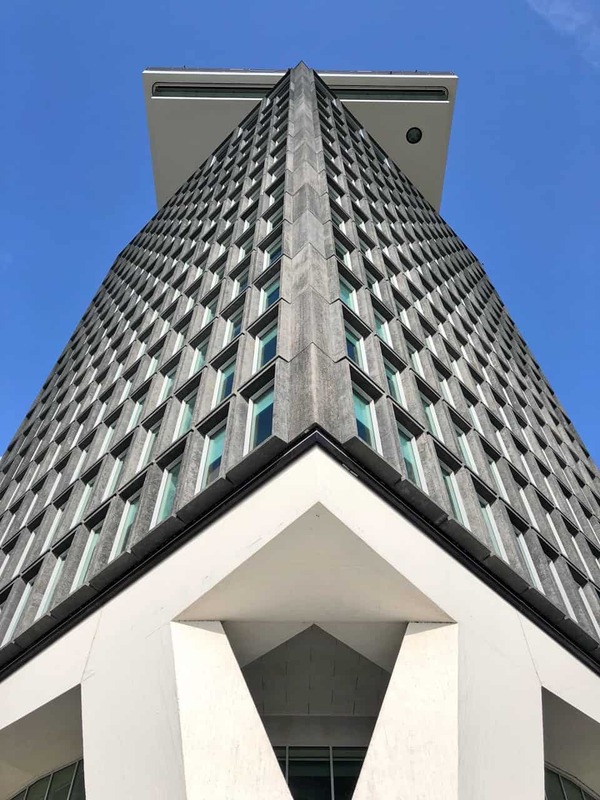 Located in North Amsterdam, the A’DAM Tower houses the Sir Adam Hotel, several restaurants and bars, and the A’DAM Lookout observation deck (which includes ‘Over The Edge’, Europe’s highest swing). The tower and the adjacent EYE Museum are easily accessible via a free 24-hour ferry service which departs from behind the Amsterdam Central Station every few minutes. Accompanied by my partner, I kicked off my birthday with a superb five-course lunch at Moon, a revolving restaurant atop the A’DAM Tower. The food was excellent and the views were simply outstanding! Unlike other revolving restaurants I’ve visited before, where the focus is the view and the quality of the food often seems like an afterthought, Moon was superb! The chef expertly utilises fresh, seasonal ingredients to create tantalising flavour combinations. In addition, the plating was beautiful! Corvina with coconut, coriander and pink pepper. Herring with beetroot, horseradish and creme fraiche. Steak with vegetables and an oyster emulsion. The views were absolutely gorgeous. A full 360-degree rotation takes approximately 1 hour 10 minutes. By the time we were done with lunch, we’d completed 2.5 rotations! Haha! My video below includes a 35-second time lapse of one rotation. The view of the harbour and the Amsterdam Central Station. 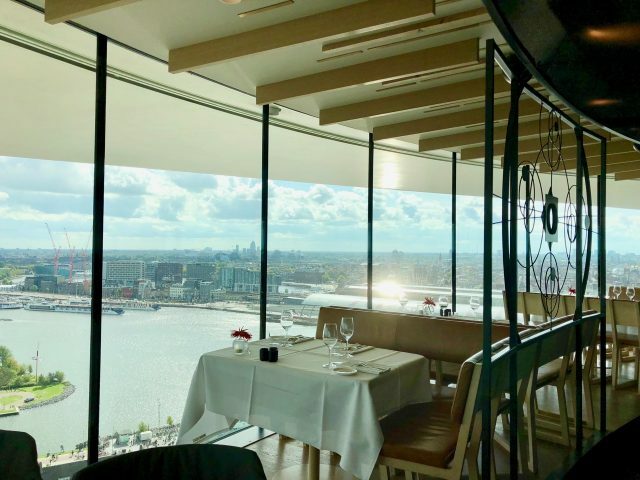 After lunch, the friendly waitress led us up some stairs to the A’DAM Lookout observation deck – restaurant patrons can visit the deck for free. There was a cool, clubby vibe on the deck, with large cushions on the ground and a DJ playing trance tunes. There were various elevated platforms as well as Europe’s highest swing, at 100 meters, the ‘Over The Edge’ swing. The Over The Edge swing at the A’DAM Lookout. The Sir Adam Hotel is one of my favourite hotels in Amsterdam and I’ve stayed there several times before. I love its funky vibe, beautiful harbour views AND the record players in every room (there’s an LP library near the Reception where you can choose your favourite albums and bring them to your room to play)! Oh, and the elevators are SO MUCH FUN!!! One is a Disco elevator, complete with 80’s music and disco ball, and the other is the Karaoke elevator! My partner and I rode those elevators many times, dancing and singing as we went up and down! Haha! My room had a colourful music theme. The music theme continues in every room, with wall paper featuring iconic LP covers and posters, the record player and other musical items – my deluxe corner room had an electric guitar hanging on the wall! There’s also a pair of binoculars to zoom in on the view. The record player in the room. A pair of binoculars to zoom in on the view. That evening, we went down to The Butcher, a bar/restaurant on the ground floor. The clubby vibe was unmistakable. We sat at the bar where the bartender wowed us with his cocktail creations. The Butcher also serves a variety of gourmet burgers and wraps. We enjoyed the rest of the evening at the bar, eating some excellent burgers and a wrap, and sipping on delicious cocktails. I had a ‘burger’ wrap at The Butcher. So good! For the party-goers, there are a variety of options at the A’DAM Tower, such as Madam a (bar/restaurant/club with a view) and The Shelter (entrance is via a hatch in the ground!). After several cocktails, we decided to go back to our room and listen to the LPs we’d taken from the library. Listening to 80’s and 90’s music couldn’t have been more fun! The next morning, we had brunch at THT (Tolhuistuin), a restaurant/café adjacent to the A’DAM Tower. The sun was shining bright, which allowed us to sit out on the deck and enjoy the harbour view. It was a great end to a fabulous birthday weekend in Amsterdam! Sounds like such a perfect birthday weekend!